The following tutorial demonstrates basic usage of RadDateTimePicker, formatting and applying themes. Drop RadDateTimePicker on the form. 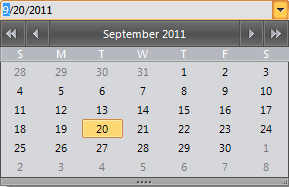 In the Properties window use the drop down calendar to set the MinDate property to the first day of the current month. Set the MaxDate property to be the last day of the current month. Set the Format property to Short. Set the ThemeName property to Office2010Black. Press F5 to run the application. You will only be able to pick dates that are within the current month, the drop down calendar will display in the Office2010BlackTheme theme and the date will display in short format. Figure 1: RadDateTimePicker with the Office2010Black theme.